We've been assisting businesses for over 40 years.Contact us to find out more about what we can do for you. A leading UK manufacturer and global supplier of Integrated Security Solutions. Borer's range of cutting edge access readers, controllers and software systems are integrated with innovative technologies, centrally managed and fully scalable for multi location businesses. FUSION works across the corporate network and is totally scalable, supporting a single site or multiple sites managed from one or several command and control centres. User details and access profiles can be imported from Active Directory or an existing database or CRM to deliver consistent and reliable data. 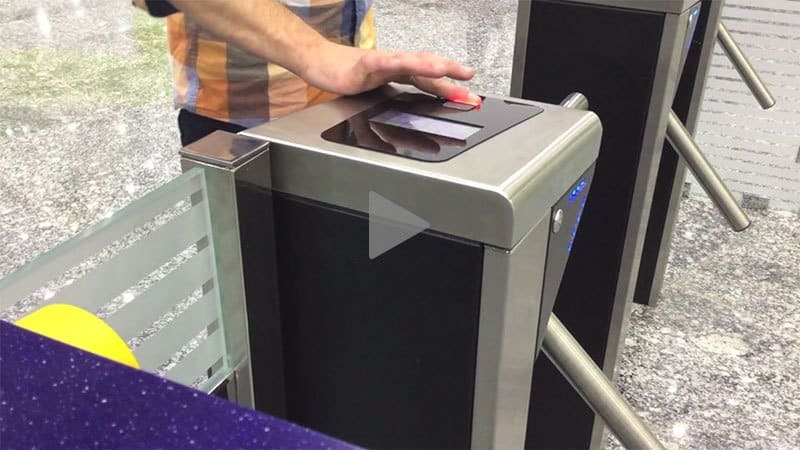 Users can use their fingerprints, mobile phones or identity cards to access premises through barriers, gates, doors, portals, pods, airlocks and turnstiles. Systems can also be enhanced with Locker Access Control and CCTV, ensuring the safety and security of staff members, visitors and their possessions. Comprehensive audit trails with supporting CCTV coverage enables management to quickly investigate potential security breaches and ensure compliance with standards and regulations. 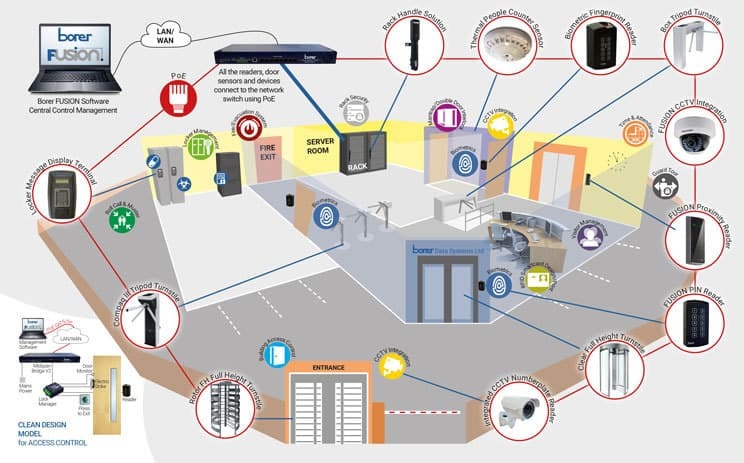 SMART SOLUTIONS @ WORK - MORE THAN ACCESS CONTROL! 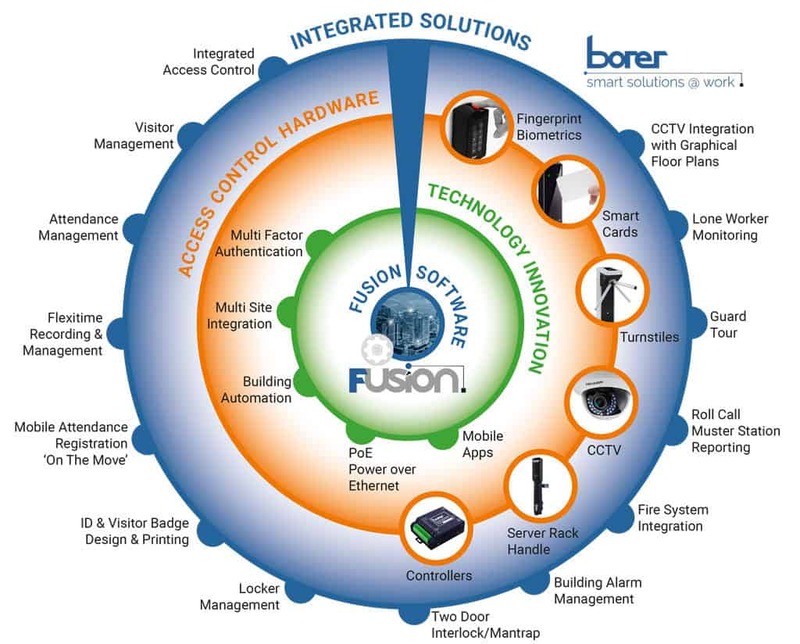 Borer's FUSION Software is constantly developing, with innovative new features and functionality being added, providing a complete, integrated access control solution that works for you! Our integrated solutions can be employed in all areas of your organisation, with central management of multiple locations, making it the perfect solution for multi-location businesses. Borer FUSION is intuitive, user-friendly software that provides central management and control of complex functions across a wide range of entry and exit points. 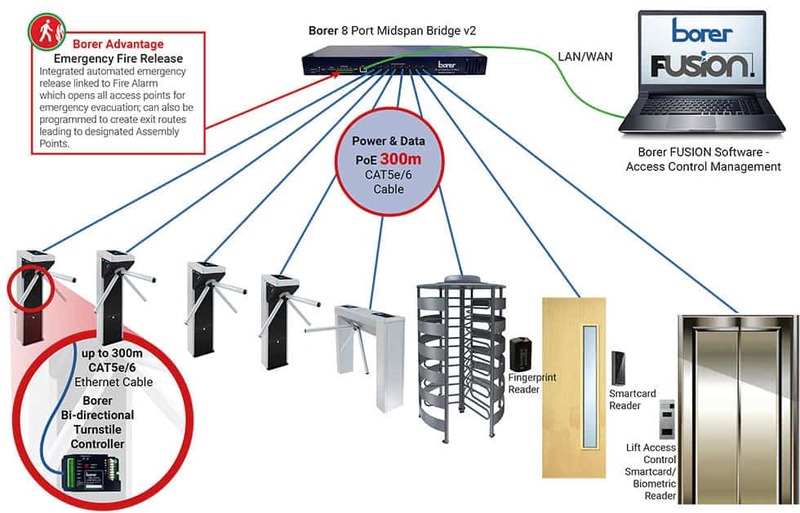 Our security equipment and access control products use PoE (Power over Ethernet) to simplify installation and keep costs down. 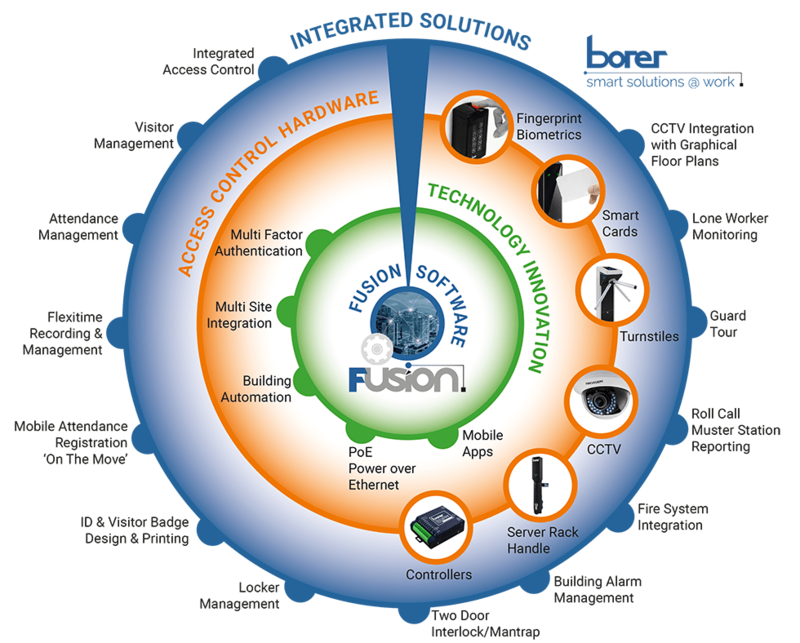 FUSION provides configuration options to suit your business needs. See how Borer FUSION controls entry and exit points. This can be scaled to manage and control thousands of doors across multiple locations.